SoCal Furs is bringing our annual FurBQ back to the fall season. 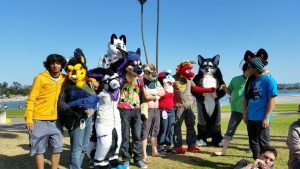 This event is all about the Southern California furry community coming together to socialize and spend a chill day outdoors. 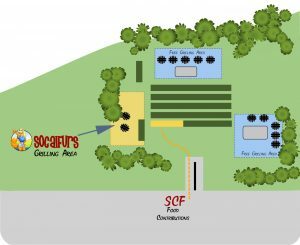 The SoCal Furs’ FurBQ has grown over the years and we have moved to a reserved area within Irvine Regional Park. 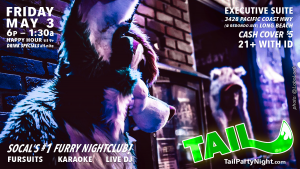 Join us for our 19th Year in celebrating food, fun and furry fandom. Directions to our New Group Area. 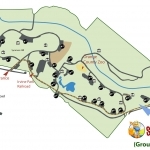 You can also check out the park map. How to Get to Our Picnic Area: When you get in, hang a right after paying at the gate. 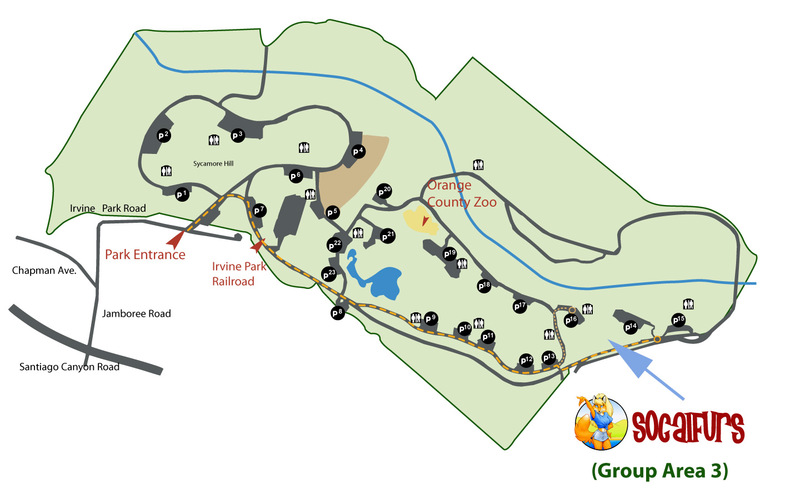 You will make your way through the park, past the railroad and OC Zoo Keep going along the road until reach Lot 13 (to your left). This looks to be the end, but it isn’t. Make a right and then a left, passing some park access gates. Parking Lot 14 is the closest to our reserved camping area, but you can also continue onto 15 for additional parking. There should be some helpful signs set up along the way to help point you in the right direction. ADA Note: The closest bathrooms to our our location is not ADA accessible, but the bathroom one area over from us is. We will post signs for your convenience, and any staff member should be able to direct you there as well. ICE ICE, BABY! Yes, we don’t need enough ice to build an igloo come morning but we sure need to have ice supplied throughout the day. So, if you are coming to the FurBQ later on, it won’t hurt to grab a bag of ice on the way in. The more this small act happens, the more we can guarantee that food and beverages will remain cold. If you are bringing meat for the grill, please notify our grill staff. Meat products will be stored together in separate coolers. If you have brought your own cooler for storing this, than please make sure you keep it close to your picnic area, and have it placed in the shade. 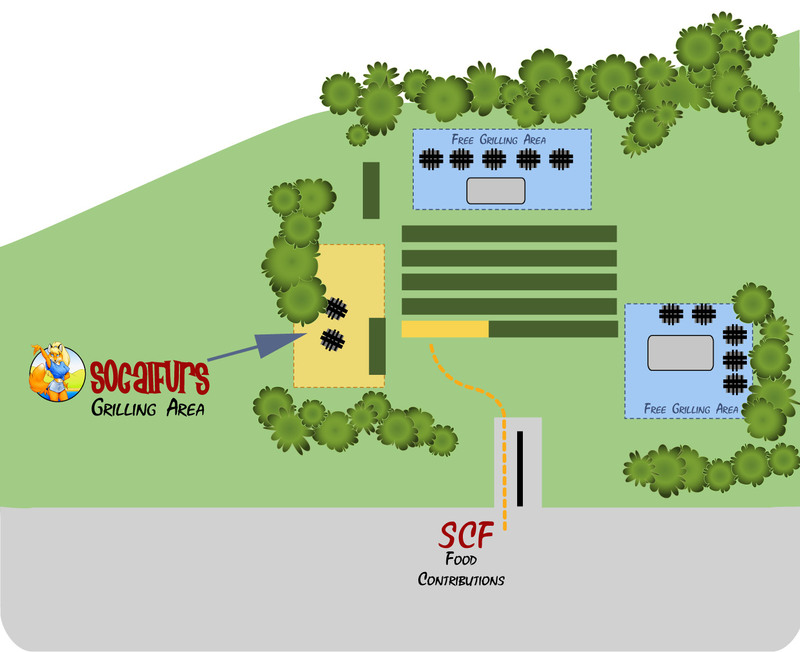 In addition to the SoCalFurs staff manned grills, there are 2 other sets of “free” grills — one in front (near the parking lot, where we grilled for 2016’s event), and another located on the opposite side, in back. These grills are free to use, but please observe all grill labels. These are to help those using a “free” grilling area establish a grill just for fish, just for meat, and just for veggies. Staff institutes such consideration for our own grill area, and we advise the same. Please keep in mind that you will be responsible for the safety of yourself and others, and are required to clean up after yourself. For the safety of those with allergies, Please: NO FISH PRODUCTS OR PRODUCTS WITH PEANUTS! FurBQ staff wants to keep these kinds of things separate. We will not allow any fish products to be placed on the SoCalFurBQ grills. Peanut products should not be grilled… period. If you have a dietary issue that requires special consideration, please let those behind the grill know so they can try and accomodate. Mayonnaise must be in single-serving packets. Due to prior incidents involving improperly stored mayo making people stick, please do not bring jars of mayo. Mayo in a jar tends to go bad very quickly (cooler or not) while it sits out in the open. The FurBQ will pick up after itself for this large event. About an hour before park closure, we will begin clean up efforts. Trash bags and tall containers to scatter around the grounds are essential items for keeping our trash under control. We know many people may have time constraints, but we ask as many people to stay back and help the cleanup process be more efficient. 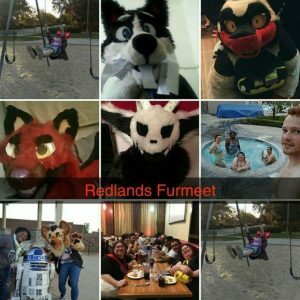 We know that many of you like to use drones for our big fursuit group shot and to get photos not possible from the ground. We have looked into local laws. As of Sept. 2017, we see no specific rule barring drones in the city of Orange or within Irvine Regional Park. However, we ask all of those operating a drone to do so responsibly. We suggest consulting the B4UFLY app from the FAA which will give real-time updates on restrictions for your area. We never seem to have problems with variety and many of us are pro-active and bring the things that they want to see out of this event. If you want to wait until just before you get there to pick up food, the nearest supermarket is the Albertsons on Chapman & Jamboree. Please be on your best behavior and follow all posted signs. With FurBQ being hosted in a paid/reserved area, we are now obligated to formally list rules, in addition to our informal set of rules and guidelines. There is NO in-and-out privileges when parking inside Irvine Regional Park: Please arrange with friends to bring in additional items if you find you need something, or consider riding a bike to the store. All parked vehicles must be completely inside a designated parking space: If you need to temporarily double-park to unload, please leave someone with the vehicle. Irvine Regional Park is hosting its Pumpkin Patch. Together with our event, this may put an impact on the parking situation. We encourage everyone to carpool, when possible. 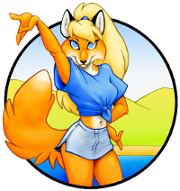 There is absolutely no vending at the SoCalFurBQ, per park rules and permit policies. If money is changing hands, this is considered vending. Goods and services (such as ready-made badges and art commissions) cannot be sold on the premises. Be sure to keep all private coolers out of the cooking area. Coolers of any kind in the cooking area will be appropriated for communal food storage. Please look after your private cooler and keep it in the shade to get the most out of your ice. As large as a group as we are, we would like to make sure that the MOOP (Matter Out Of Place, aka TRASH) is properly collected and disposed of, which will keep the park officials happy with us. 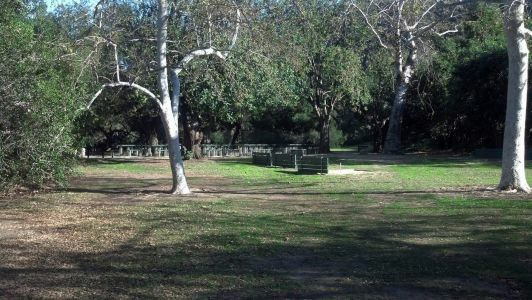 Large sound systems are NOT allowed at Irvine Regional Park. This includes megaphones, car audio systems and items with large speakers. We love music and do not mind someone bringing a personal radio, but please be considerate to others around us. Tents and hammocks are prohibited in Irvine Regional Park. While fursuiting is encouraged at our event, we did have to talk to the park about shade structures and portable pavilions (also called “Easy Up”s). They do allow us to place such structures on our reserved area, providing that one wall (“door”) is left open in the times that no one is changing clothing.For the 2017 year, we have been informed the San Diego Furries will be bringing a changing tent (2 EZ ups put together). Thanks so much guys! All Four-legged attendees must be on a leash. As per park rules, you must clean up after them (no landmines should be left in the grassy areas). Additionally, please be responsible for your dog’s behavior when interacting with other attendees and dogs.